The Insider’s Story on the Girard-Perregaux Gyromatic Chronometer HF (High Frequency) caliber 32A is written by Tim Siragusa from Perth, Australia. His never-ending enthusiasm for this chronometer rated caliber 32A movement has led him to write a story on this item. The Girard-Perregaux Chronometer HF was made in response to the quest for more accurate watch movements. It was based on an AS calibre to which a proprietary automatic winding unit and rotor were added, from which the movement family “Gyromatic” was named. The winding mechanism works as shown in the diagram below. This first generation movement is identified by the movement code on the plate underneath the rotor which will always have “32A” and three digits representing the batch number. Chronometry had been regarded as the pinnacle of watchmaking since the 18th century. In 1966 Girard-Perregaux began submitting their newly developed Gyromatic Calibre 32A movements to the Bureaux officiels de contrôle de la marche des montres (B.O). 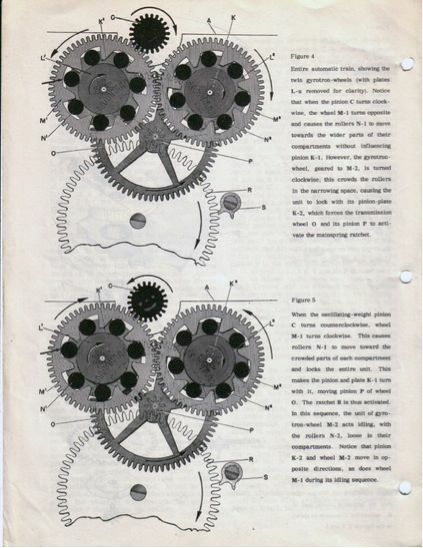 This calibre oscillates at 36 000 vibrations per hour (vph), and was a continuation in the development of the line, as increasing the frequency of the movement’s oscillations was preferable to increasing the size of the balance wheel. The theory was, the faster the balance swing, the less impact on timekeeping variations from positional change and variation in temperature. Earlier Gyromatic models had calibres running at 18 000 (all 21 and 22 series) and 21 600 vph (most of the 32 series, excluding the 32.7 and 32A) and the overwhelming majority of Gyromatics already produced did not meet the exacting requirements of chronometer certification. The first, the 21 series was introduced in 1957 and the 32 series in 1962. In 1966, the in house research and development team (a rarity among watch manufacturers then) was ready. The Gyromatic Chronometer HF with its fantastic quality high beat movement, featuring hack seconds, micro metric fine regulator screw, ISOVAL self-compensating hairspring and monometallic balance was made in a serial production run of 662. The chronometer test for each of the 662 cased movements was conducted by the B.O. for 15 consecutive days in six positions and three temperatures. Every Chronometer HF proved precise enough to have received the additional distinction of “especially good results” printed on the issued certificate called a “bulletin de marche”. However, 40 of these watches were in addition submitted to the Neuchatel Observatory for a secondary, longer test period of 45 days. These models are identifiable by the “Observatory Chronometer” signature on their dials as opposed to the “Chronometer HF” as seen here. Typically, an Observatory Chronometer would be certified as having a daily error rate to a fraction of a second, indicating that Chronometer HFs with exactly the same components could also achieve such results with careful adjustment and regulation. To reward Girard-Perregaux for their efforts to deliver so many chronometers, the Neuchatel Observatory, in its centenary year awarded a prize in recognition. 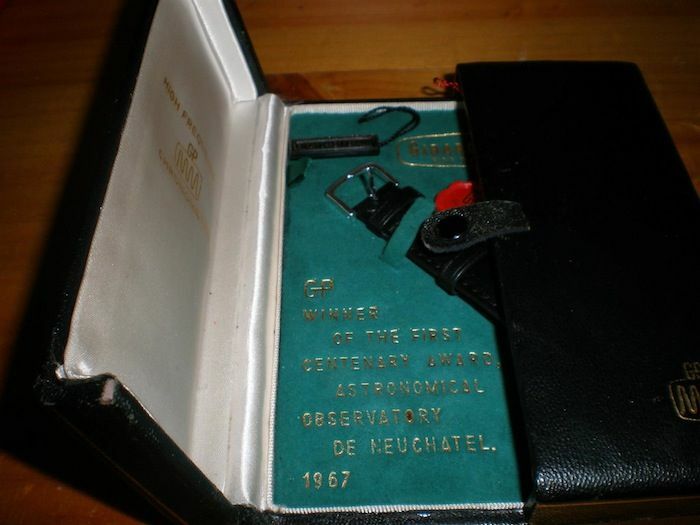 This is noted in the inner box and on the special hang tag unique to these watches. It is important to mention that just because a watch can maintain +4/-6 seconds accuracy per day or better, does not mean chronometer certificates will be issued. The quality of individual parts must also be of high standard. There are comments that the movements of these watches are not highly decorated with Geneva Stripes or perlage. However, the lack of decoration should not be fixated upon. The main aim was superlative accuracy at a midrange (for the steel version) price, which was achieved. These watches sold in the US for $170-$485, depending on the model. For comparison, a 1967 Heuer Carrera 2447S cost $89.50 and a 1967 1675 Rolex GMT-Master cost $225. Regarding of the chronometer testing, it is important to remember that these watches were serial production models and not competition prototypes, as previously submitted wristwatches and pocket watches from various manufacturers were. These watches were the fastest oscillating watches at the time and they were meant to be worn. As a result, perfect examples are hard to find and a new old stock example of any original case metal with box and papers would be an ethereal dream for many collectors. This particular watch was found on eBay. The seller indicated that it was working, but had been stored for 20 years. The watch is working very well, and the 34mm case (measurement minus crown) is average sized for the time. The 10mm high case means that the watch does not have an overbearing effect. As you can see in the photos, both boxes, tags and all papers are present and I have not seen another complete set anywhere. It is important to ensure that the dial is unblemished as the factory does not restore them to original. A service dial is used and the differences are noticeable. The seller did not post a photo of the movement on the sale listing and did not have the confidence to open the case. However, the chronometer registration card and the bulletin de marche photos had identical certification numbers. What were the odds of the set not matching? Somewhat unlikely, so I took a gamble and it paid off. The certification on the registration card and bulletin marches the engraved number near the balance wheel. I am happy with the decision I made. I didn’t realise that the outer box was unique to this model, having only seen a photo of the interior of the inner box without paperwork or tags on PuristsPro’s website from 2008, which was known then as Horomundi. 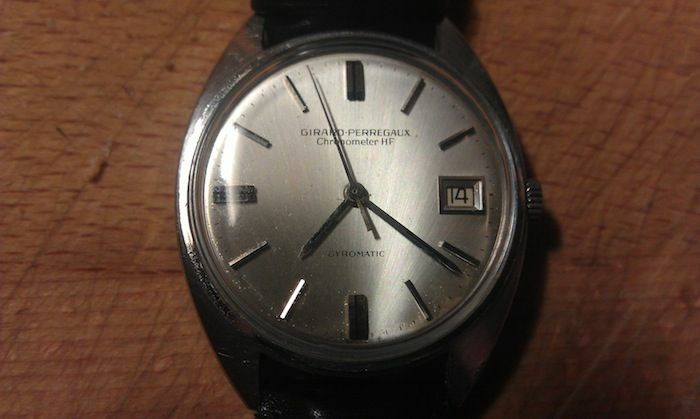 The “sine wave” logo does not appear on any other Girard-Perregaux watch collection other than the chronometers. The escape wheel teeth and complete pallet must never be cleaned or lubricated. 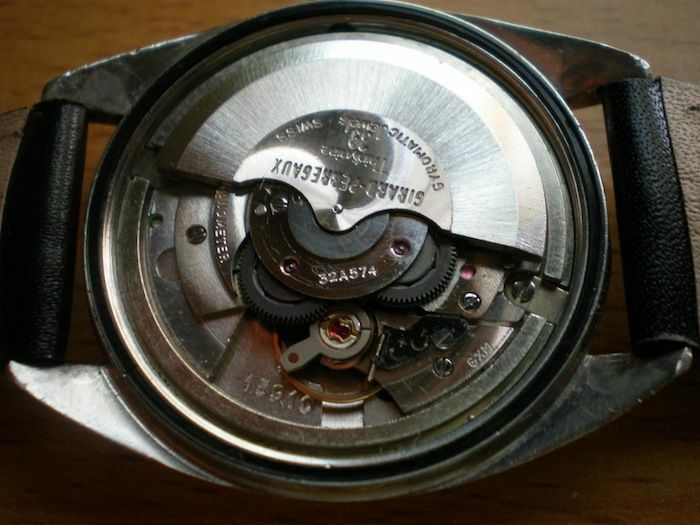 Some parts have been permanently dry lubricated due to the high speed of the movement. Regular oil would simply fly off the parts due to inertia. 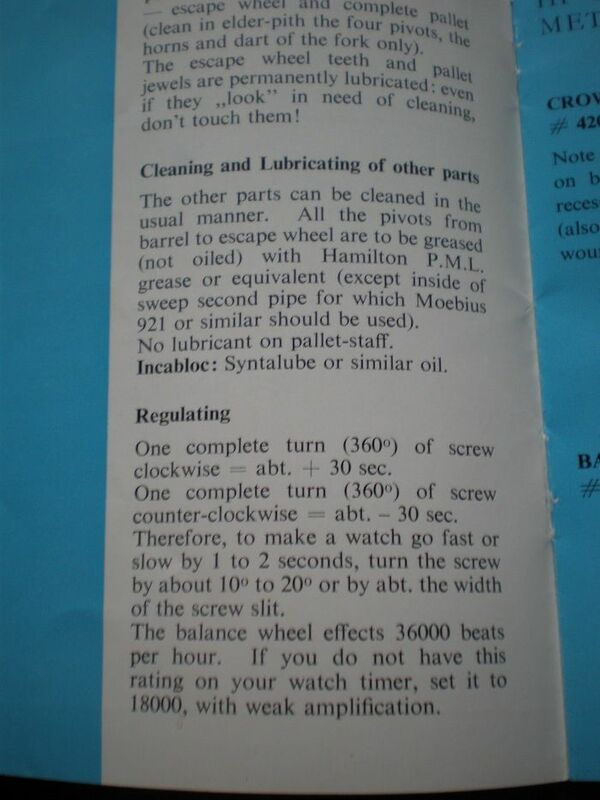 These watches needed special lubrication and greasing. However, this allowed owners peace of mind after purchase. These watches were sold with one year warranties and guarantees of accuracy within 1 minute per month or free adjustment within a year of purchase. 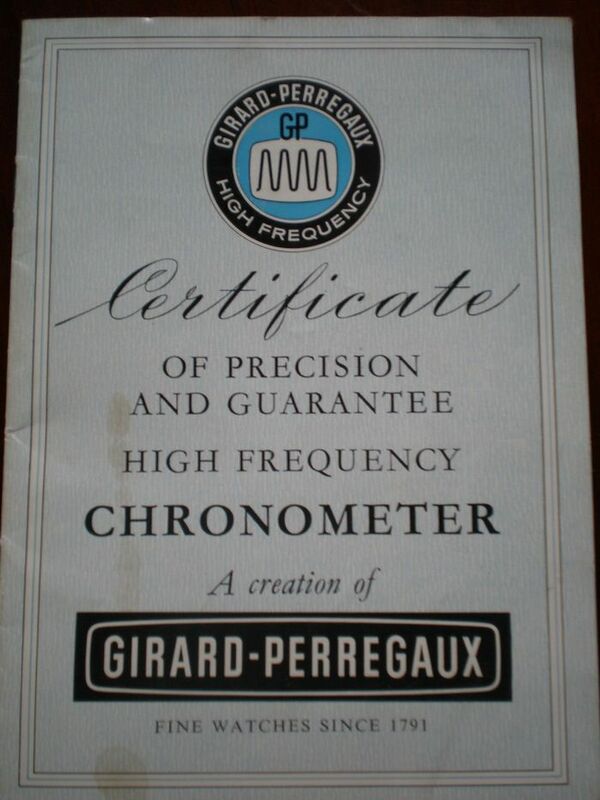 The Guarantee also notes that it is possible to synchronize a Chronometer HF if the mainspring is not at full tension by holding the sweep seconds hand still at 12 with the crown and releasing it when ready as a form of hacking seconds. The movement also features a quickset date, which is quite a nice feature. By turning the hands to about 8:40 and advancing to 12:00 repeatedly, quickset adjustments can be made. My watch is in good original condition. Only the strap and buckle has been changed since new. It was on a Speidel Twist-O-Flex bracelet when I purchased it and I replaced it with an 18mm black calfskin strap. I am currently testing the accuracy against an atomic clock application on my Android phone and so far it has only lost a second per day. Not bad at all. I have been collecting the 32A powered watches for a couple of years now and Girard-Perregaux watches generally for about four years. I began collecting these particular watches as the quest for precision in a mechanical watch was quite interesting to me. After all not many people wear mechanical watches “because they’re accurate”. The fact that these watches were the ultimate in terms of accuracy before the “quartz crisis” ensures their place in horological history. The rarity factor appealed as I’d read various articles and forum posts about these watches which gave me adequate information to spot good examples. Good examples are getting harder and harder to find, as the years go by. Badly treated cases are a concern. The original finish for the majority of watches was a brushed steel top and sides with polished underside for steel variants. Gold plated versions in any condition are rarer. Solid gold variants had polished cases and coin edge bezels. Badly damaged dials and rusty movements are not easy to fix on such rare watches. Of course, some movement parts would theoretically be interchangeable with other 32 series, but this would take expert analysis or advice from the factory. 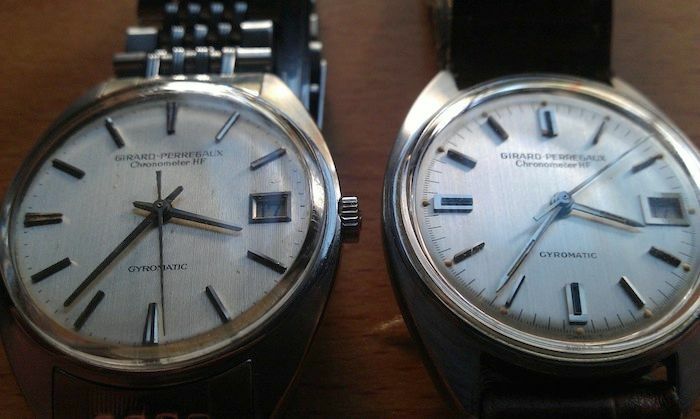 On this photo showing two Chronometer HF’s, it is interesting to note subtle differences on the dial. For example, the watch on the right has thicker black inlays and 1/5 of a second graduations on the dial. The date window has a significantly thicker frame too. In the commonly seen advertising, Observatory chronometers have brown leather straps, whereas Chronometer HFs have a chain link style steel bracelet which appears to be similar to Gay Freres manufactured bracelets made for other brands. 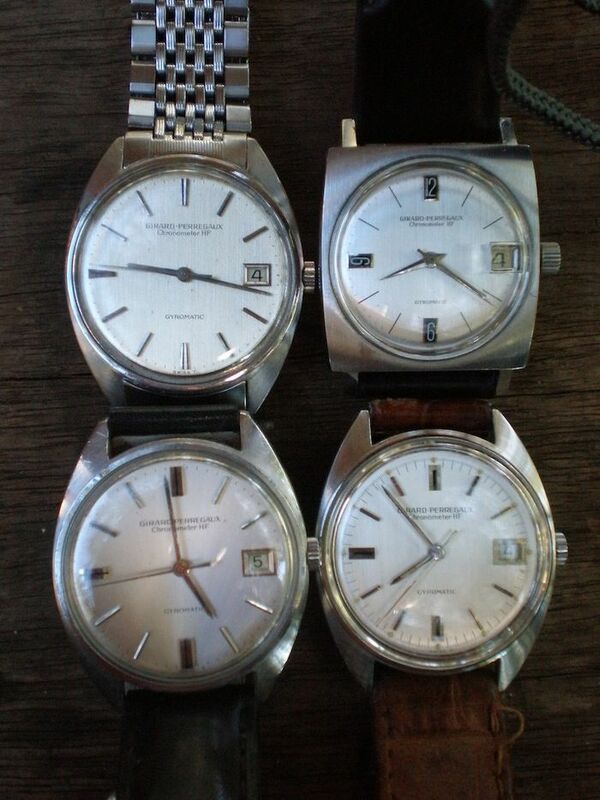 Here is a photo showing four of my Chronometer HFs. A big thank you to Tim Siragusa for contributing his article on the Girard-Perregaux Gyromatic Chronometer HF watches here in Fratellowatches.